It is rotated by prime mover and produces a dc voltage. i.e. Convert mechanical energy into electrical energy. It receives energy from a dc voltage source and rotates at Speed proportional to the applied voltage i.e .converts electrical energy into a mechanical energy. Field Winding : It is Stationary Which does not move. Armature Winding :It placed in rotor and it is movable (Simple Loop Generator). 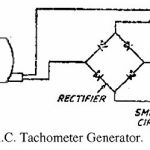 Draw wave of DC generator in following Case. 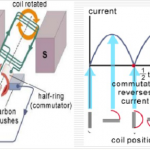 Its turn coil is rotating about its own axis in a magnetic field provided by permanent magnet with two poles N and S .
The ends of coil are joined in two silpring C1 and C2. The slip ring rotate along with shaft the brushes do not rotate induce . 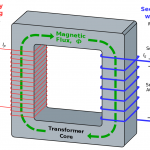 as coil rotates flux limned with it changes Hence an emf is induced magnetic Induction . The induced emf is zero when plane of Contactor motion is parallel top lane of magnetic flux. this induced emf maximum when the perpendicular to the plane of magnetic flux. e=blvsin?. Here, B, l and u are magnetic flax density, length of conductor and velocity of moving conductor which are constant. Hence e is directly proportional to sin? .’. shape of induced emf is sine wave. It was single than alternator produce sine wave.